If you are planning a trip to Disney soon, I wanted to show you a few unexpected places to find goodies for your trip. I will be focusing on one store at a time. Today we are shopping at Toys R Us. I was in my local store yesterday and saw a few things that you may be interested in. All of the summer stuff is 70% off. They had Mickey bubbles for about a $1...perfect for blowing while waiting in line at Disney. 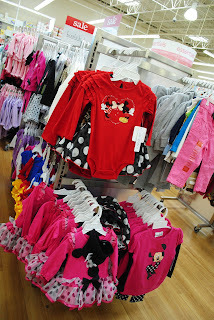 They had Disney clothes galore....perfect for wearing on your trip. I especially liked the Snow White shirt that looks like a dress. It would be cute with leggings, a shirt or even jeans. This is the dress that I picked up for Sally. She LOVES it!! Wouldn't your little Minnie look adorable wearing this with the "real" Minnie Mouse? The words "Babies" and "Toys" have become synonymous with each other. You always see babies with their toys and there is a reason for that. That is why some years ago, it was not one of the projected trend that women would be buying clothes online. But it seems like nothing is stopping the children of Eve from shopping, even online. Right now, one of the best places to shop for fashion apparel is though an online store. Don't expect any of them to be too reasuring though. Your money is probably in another country right now. The field of beauty gear is always developing Lucy Liu Skin Care including an ever increasing number of retailers that sell new and utilized hardware.